Scotland international Tommy Seymour is all set to make his 100th appearance for his club Glasgow Warriors when they take on Leinster in the upcoming Pro 12 clash on Friday. The 28-year-old made his debut for the Scotstoun outfit in 2011 having been a part of Ulster previously. 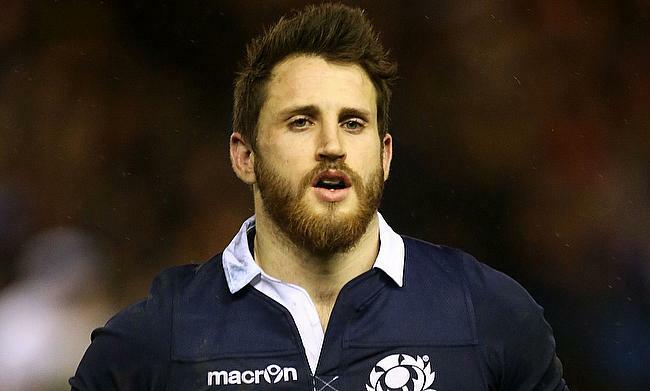 He went on to qualify to play for Scotland through his Glasgow-born mother in October 2012 and has made 36 appearances until now, scoring 16 tries in it. Seymour also became one of the two Scottish player along with Stuart Hogg to become a part of the British and Irish Lions squad for the upcoming tour of New Zealand in June. He has been named at fullback for Friday's clash along with Leonardo Sarto and Lee Jones forming the back three while Peter Horne has been the preferred number 10 ahead of Finn Russell. Head coach Gregor Townsend, who is set to take in charge of Scotland in June lavished praise on Seymour. “It has been a good couple of weeks for Tommy, he’s always looking to develop and better himself and it’s great for him to reach a personal milestone," said Townsend. We will need to wait to see Glasglow Warriors´ performance at the Pro12 Clash against Leinster, and specially Tommy Seymours´ to see if expectations are met. In the meantime, the Scottish rugby world is also getting ready for the European Rugby Challenge Cup and 2016-17 European Rugby Champions Cup competitions, which will be held this year in the capital, Edinburgh, on May 12th and 13th. If you like having a bet in rugby this is your chance to start analyzing how Tommy is performing in his new position, since he usually plays as a wing. Visit the Free Bets UK website and have a look at the bet365 information page to see if you can take advantage of one of the many offers and promotions available. The Free Bets website provides plenty of betting offers for new bookie customers so you’ll have the chance to take advantage of deposit bonuses and free promotions. T Seymour; L Sarto, N Grigg, S Johnson, L Jones; P Horne, H Pyrgos; A Allan, F Brown, S Puafisi; B Alainu'uese, J Gray; T Swinson, C Fusaro, A Ashe. Replacements: P MacArthur, G Reid, Z Fagerson, R Harley, M Fagerson, A Price, F Russell, A Dunbar.